Do you eagerly devour news of new restaurant openings, sneak peaks at menus, and early press on what to eat at the latest hot spot? Do you check your inbox daily to see what Grubstreet, Serious Eats, Urban Daddy, Tasting Table and Eater are saying? And have you noticed that they all seem to be saying the SAME thing? Can everyone really have the same dining experience and opinions about food? Obviously there’s something else going on here. But that doesn’t stop us from trying to score a table (usually super early or really late) in the first few weeks of an opening to see if the buzz was warranted. Or maybe we wait until the hype dies down to try the restaurant – after the reviews that would necessarily determine its survival for at least a few months or sound its immediate death knell. But I’ve come to the conclusion that if a restaurant gets a good review by any of the by now well-known critics, I really could care less. Instead, I’ve become critical of the critics. Although I try a lot of places, I haven’t shared my thoughts in this forum. That’s because I don’t think it’s fair to review a restaurant that I’ve only been to once just to pan it — or to praise it. (It might have been a randomly good or bad dining experience.) Until now. It’s time to open the discussion to the general public — those who actually keep these places in business and spend their hard-earned money and precious time dining out. So going forward, I’ll be keeping you informed of where I’ve dined. Not full restaurant reviews unless I’ve dined more than once, but brief descriptions to let you know if I agree or disagree with the critics or maybe found a great place the critics haven’t found. 1. The critics are not anonymous. 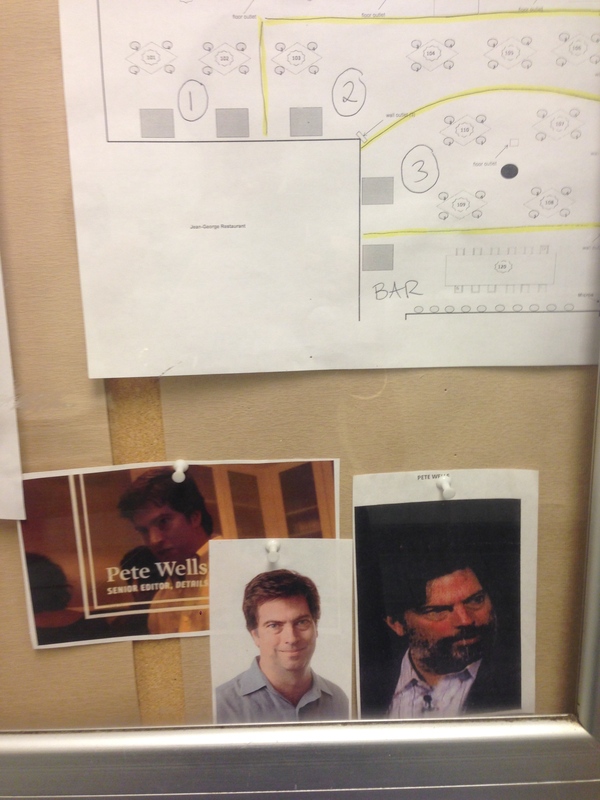 Go into the kitchen of any restaurant — well-established or brand new — and you will see photos of Pete Wells, Adam Platt, Ryan Sutton, Robert Sietsema … even elite Yelpers and bloggers can have their pictures on the wall so the waitstaff and kitchen are ready to make sure they have the optimal dining experience lest there be a negative review. But they don’t know you. Will you be enamored of the dim lighting when you’re seated at a table near the bathroom, even when there’s no one in the restaurant? 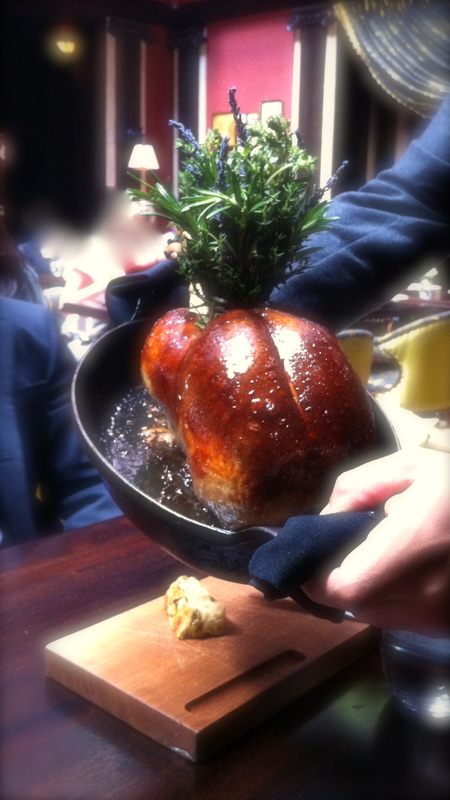 Will you think the guest chef is so fabulous if you’re served a dish that his missing a key component? (not naming names here) You, as the average Joe, are simply not going to have the same dining experience as any of these critics. Sure, the food might be good. But you will pay more, have a very different level of service and frequently be confused when you try to order whatever these critics claim to have eaten, usually items that aren’t on the menu anymore. 2. Steer clear of reviews highlighting “THE” dish to get. Critics write about what the restaurants want them to eat — advance menus stir up buzz about a chef’s “signature dish” — but be wary if it’s a simple ingredient with a huge profit margin. A “small plate” of wood-fired octopus for $18, a $25 Pat LaFrieda custom blend burger, a bowl of spicy ramen for $15, or that $20 cauliflower steak on every menu of late … Don’t just tell me to eat it, tell me why this is any better or different than the burger down the street, and why I should spend 5 times what it costs to make the dish (especially if it’s something I can cook at home). Does this look like it’s worth $80?? And those special entrees for two? A gimmick. No one should pay that much for chicken for two. 3. The best dishes are often the ones the critics never mention. 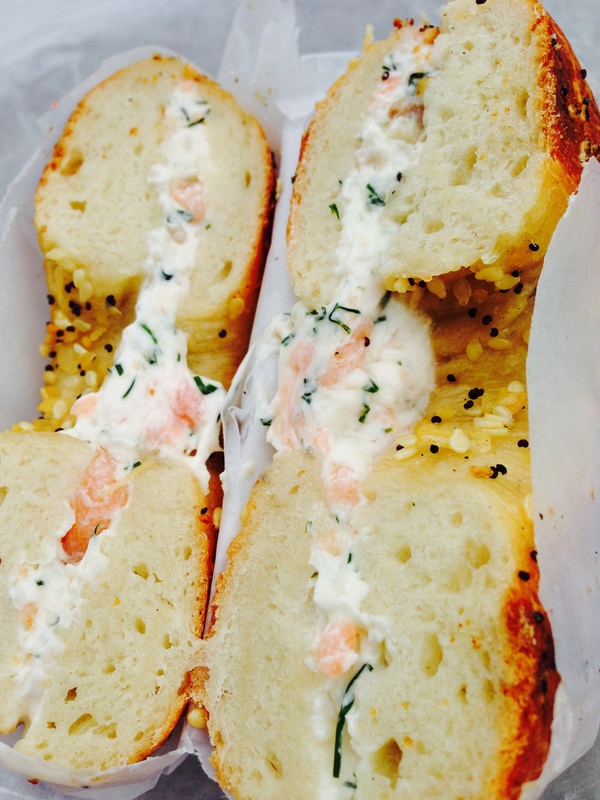 For example, the everything bagel at Black Seed Bagels with the lox spread was great and didn’t cost $20! Most recently and what really prompted this post were the reviews I’ve been reading for Cherche Midi- the new Keith McNally place. I went in the first few weeks it was open and before any real review was out. I had a reservation and waited half an hour. Food took forever to come out of the kitchen. Forgiveable, since it was the first week, but certainly nothing I’ve read in any of the reviews…. I had a very specific reason for going — the frogs legs. After coming back from Paris (where I curiously could not find frogs legs on menus), I had to have them. And they were delicious and reasonably priced! (Too bad my photo was blurry and the lighting is very dim.) Now do you think that any of the review has mentioned the frogs legs – which is a dish that doesn’t happen to be on most NYC menus? Of course not. Did they mention the lobster ravioli- where you get the essence of lobster? Not with any detail that shows someone really ate it. 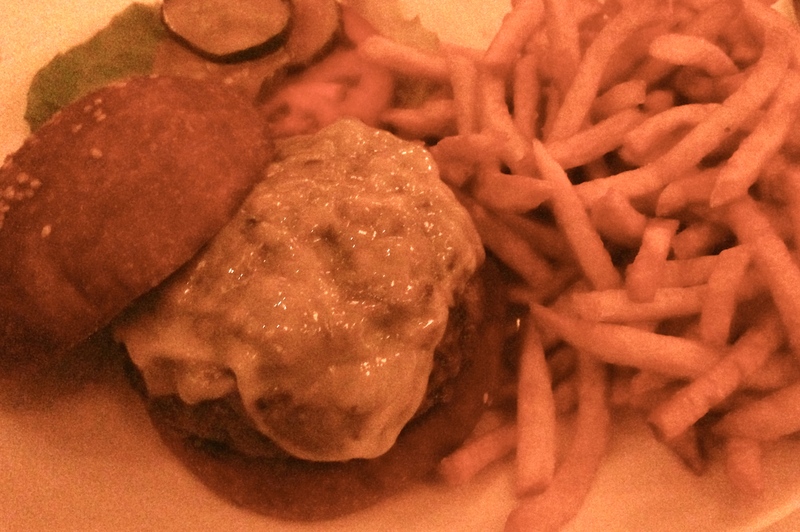 Instead, they give rave reviews to the steak frites- which were actually well below average. Or an uni pasta special that the server told us didn’t really contain any dollops of uni and not to order at the absurd price. 4. For the most part, the hottest chefs automatically get good reviews – unless they’re on TV a lot. * Grab a seat at the bar at Alder. Order something besides the clam chowder. Tell me if you like it. I didn’t. 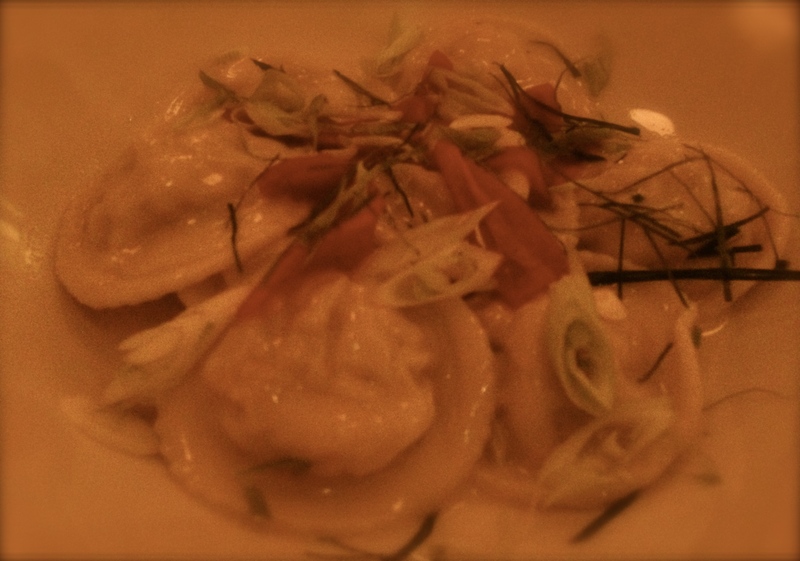 Most things were weird, small-portioned, and just not good. And I’ve eaten at WD-50 and absolutely LOVED it. This is not the same thing – and if Wylie Dufresne dined with me, I’m pretty sure he wouldn’t be so thrilled with what I ate at Alder either. Let me know the last time Jean-Georges, Daniel Boulud, Marcus Samuelsson, Eric Ripert, David Chang was panned. They don’t. Every dish, every time cannot be that good. And it isn’t. But star chefs have teams of PR people to ensure that you think it is. It has gotten to the point that diners feel compelled to say they like certain place that they don’t. It must be you — not them. After all, who will listen to you when all the critics are saying something different? I had ramen at Momofuku Noodle where they forgot to put the egg on it. 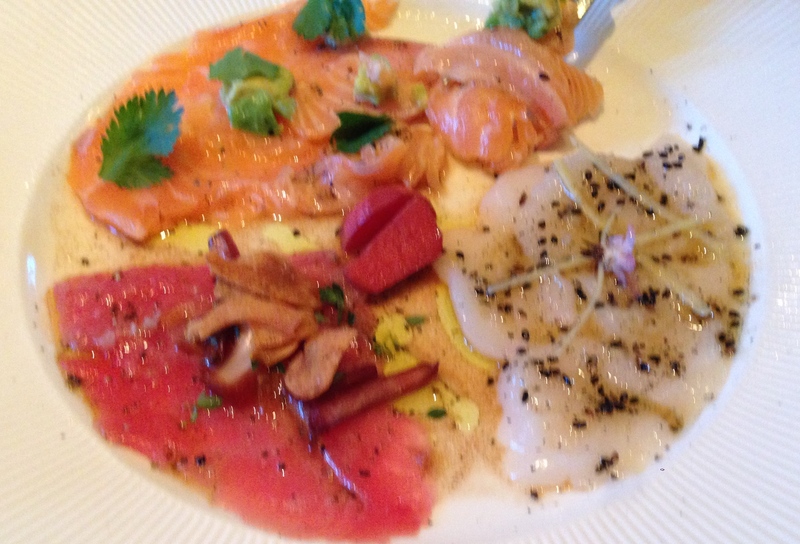 Tasteless poached salmon at Le Bernardin and horrifying service at Daniel. And see my comments on Jean-Georges in the final point. Of course, I’ve had many great meals where there is a star chef– but that shouldn’t guarantee a good review. I’m happy to form my own opinions and agree that the spicy beef ramen at Kung Fu Little Steamed Dumplings is good (though the others are bland). And Ivan Ramen spicy noodles were good. So if I’m at Gotham West Market, I will eat that and avoid the reheated, tiny sandwiches at Court Street Grocers (yuck). 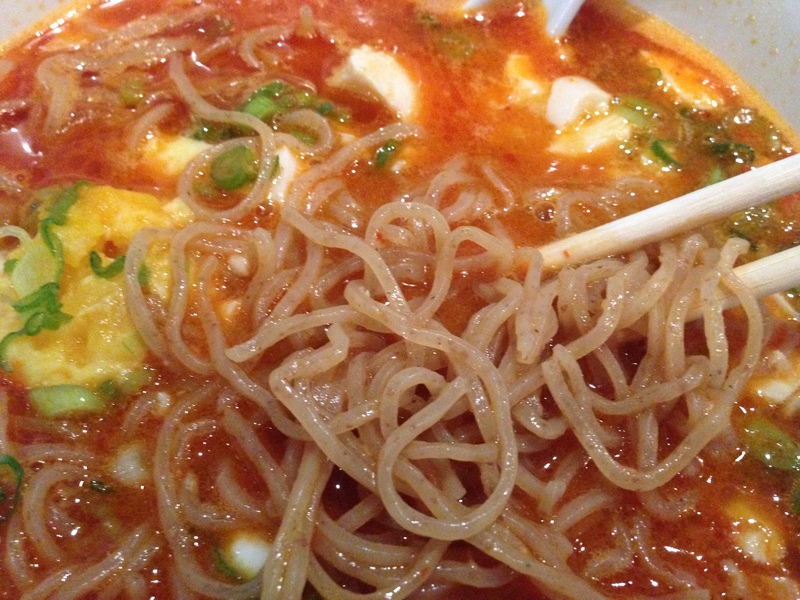 The spicy noodles at Ivan Ramen were pretty good. But not having a named chef shouldn’t mean that a restaurant is panned. I’ve eaten at Tavern on the Green – it’s not the best, but it’s not that terrible – and it’s certainly not that over-priced given the setting and similar places in this city. I’ve certainly had worse meals at places with more stars. The biggest problem it suffers from is that the new owners didn’t associate themselves with a menu created by someone already beloved in this town. A situation that can easily be cured before the critics send them back into bankruptcy (although by my estimation, the guests keep coming regardless of the negative publicity). *Bobby Flay isn’t necessarily beloved by the food critics (although the people can’t get enough of him). But that’s why he was at the helm of Gato when it opened. He isn’t going to risk the backlash that Guy Fieri had. 5. Lunch is a different story. It’s the same price as dinner at most places or at least close to being as expensive. And you can get the B team – especially in summer. 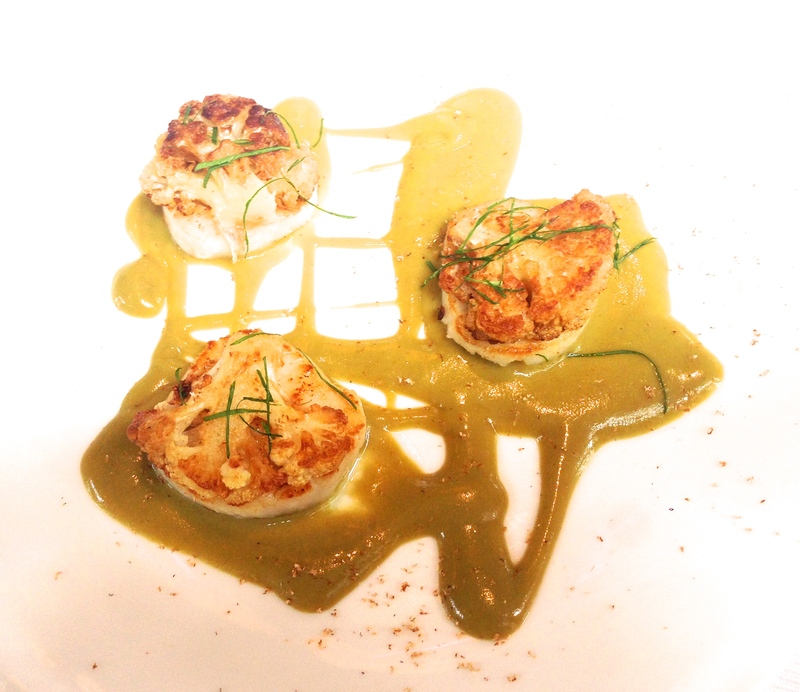 A plate of scallops at Jean-Georges was drowning in cumin sauce. 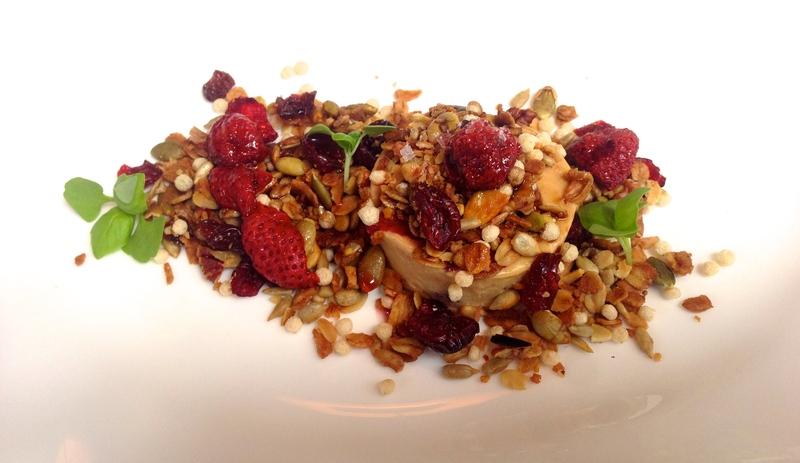 Foie gras was masked in the granola fruit concoction that overpowered it. Do the critics ever try a place during the day? Not that I’ve read about, other than a brief mention that maybe a special burger might be available at lunch – and they likely never tasted it themselves. But it’s usually a good way for you to see what a restaurant is really about. And lunch — if it’s the same price as dinner — should be just as good.